EasyTFT board is a perfect choice for users or mikroElektronika boards who want to upgrade their GLCD with TFT display. It features connector compatible with GLCD 128x64 connectors, as well as touch panel connectors. 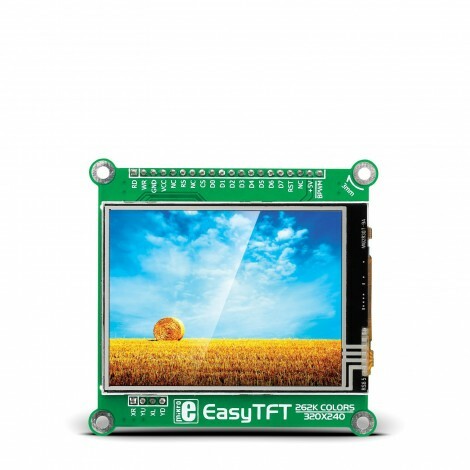 EasyTFT board is a perfect choice for users or mikroElektronika boards who want to upgrade their GLCD with TFT display. It features connector compatible with GLCD 128x64 connectors, as well as touch panel connectors. Board also contains TFT Color Display MI0283QT-9A with 320x240px resolution, which is driven by ILI9341 display controller, capable of showing advanced graphical content. It also features a Touch Screen and therefore can be used as input device. Board contains mounting holes for easier integration into your designs. Key Benefits Compatible with 7th generation Easy boards. Pin compatible replacement for GLCD 128x64 display.